OLED HDTV’s were introduced to the US market in July of 2013 with only a couple of models to choose from: The Samsung KN55S9C and the LG 55EA9800 which is the focus of this review. Fast forward one year later and these are still the only two models available in the US. Well, actually there are three if you count the LG 55EA8800 which is essentially the same set as the 55EA9800 but without the curved screen. It also has what LG calls a Gallery Screen which is a frame that surrounds the set to give it the appearance of a painting. This frame also houses several speakers for better sound quality. For info on OLED technology click here. The 55EA9800 also has built-in Wi-Fi for a wireless connection to your network. If you desire to watch 3D content this TV comes with four pairs of passive technology 3D glasses. The EA9800 features LG’s Magic Remote which offers voice command capability that allows you to control certain functions using your voice. For example, you can change the volume and channel, as well as accessing content from providers like Netflix, Hulu Plus and YouTube. The Voice Command can also be used for internet apps, social networking and web browsing. The Magic Remote also operates the TV as though it was a wireless mouse and has a point and click feature that allows you to navigate menus and to select icons. The EA9800 is a smart TV and contains a platform that is considered one of the best on the market and features a large selection of apps which can be accessed using the sets Voice Command function in the Magic Remote. There has been a lot of talk about the curve design on many of the latest HDTV’s released in 2013 and 2014. Manufacturers such as LG claim the curve enhances picture performance. LG bases this claim on the huge IMAX theater curved screens that do enhance picture quality, due in-part to their extreme size. So can a 55” curved screen do the same? I doubt it. And that seems to be the consensus of most enthusiast in the HDTV industry, myself included. The only proven benefit of the curved design is aesthetic appeal, and the marketing departments of these HDTV manufacturers hope this design feature will appeal to consumers. Personally I like the curve design but I would not base my buying decision on this feature. Before I was actually able to view and review an OLED HDTV I was tuned in to all the hype regarding this new technologies picture quality. Now that I have experienced it for myself…I must say all the hype was true. The images produced by the LG 55EA9800 were astounding and very accurate. The color rendition produced by this HDTV were highly saturated, dynamic and very vibrant which made the colors pop from the screen. Detail and clarity were absolutely amazing… for example, a shot of an open field filled with green foliage allowed me to see all the intricate detail of each blade of grass. Contrast levels were like none I’ve seen before, from the brightness whites to the deepest blacks. And speaking of black levels, this set produced the best black levels I have ever seen. The dark areas of the images I viewed were absolute black. This was due to the “organic light emitting” diodes used in this TV technology being self illuminating (not requiring a backlight) and having the capability to turn completely off in dark picture areas when needed. This gives OLED HDTV’s true infinite contrast capability. The 55EA9800 produces better black levels than any plasma TV to ever hit the market, including the excellent Panasonic TC ZT60 series which is arguably the best plasma TV ever made. Side angle viewing on this set was excellent with no dimming of the image. This is another advantage of the OLED technology. The curved screen didn’t appear to have a negative effect on picture quality within reasonable viewing angle positions. I did not experience any motion blur with this OLED display. However, I have read of some cases of motion blur in the form of picture judder (images that don’t produce a smooth camera pan). I was able to compare the 55EA9800 to a couple of excellent performing 4K LED displays – The Sony XBR65X900B and the Samsung UN65HU9000. The colors of the 55EA9800 were more dynamic and saturated than the two 4K models, and gave the images of the EA9800 a very rich and bold appearance. The 4K displays could not match the superior black levels produced by the OLED display which was totally inky black, and gave the EA9800 better contrast reproduction than the 4K displays. The area were the 4K TVs did have an advantage was in display resolution. The higher resolution of these displays produced better detail and texture and gave their images a more transparent “you are there” look. The OLED display can only produce images up to 1080p resolution. However, 4K OLED displays are in the works. If I had to choose between a 4K Ultra HD display vs. the current 1080p OLED technology, I would go with an OLED display due to it’s superior black levels, better color rendition and the natural look of the picture image. 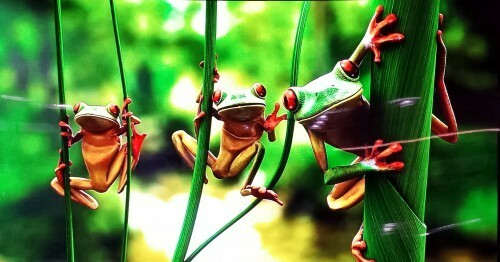 The LG 55EA9800 produced some the finest HDTV images I have seen to date. Over-all picture quality is about the best there is, with contrast and black levels un-matched by any other TV technology. Keep in mind that the current OLED HDTV’s are first generation models, and with each new generation the technology will be continually refined and improved, which means OLED TV’s will only get better and better over time. So is now a good time to invest in an OLED display you ask? Well, if you are an early adopter of new electronic gadgets and desire to have the most up-to-date cutting edge technology and are not concerned about 4K resolution… I say go for it especially since the price of first year models have dropped drastically, and the picture quality of the current models straight out-of-the-box is already excellent. Personally for me I usually wait for second or third generation models of any new technology or product just in case there are any bugs or flaws that need to be worked out. OLED HDTV’s are definitely the wave of the future as far as display technology is concerned (in my opinion) and the LG 55EA9800 gets OLED TV’s off to a great start delivering outstanding picture quality that is a pleasure to watch. Highly recommended. Have any questions or comments about this review or OLED HTDV’s? I would like to hear from you. Please leave your comments below. 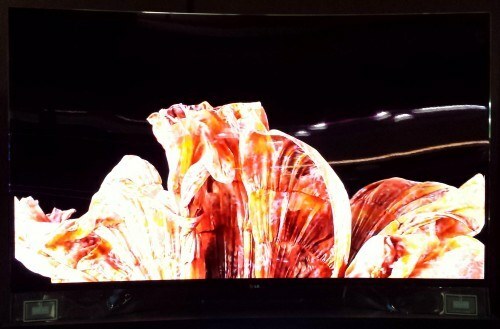 See LG’s latest version (2014 model) of this awesome OLED display… the 55EC9300.